Home > Construction Training Manuals > Construction Electrician Basic > Figure 5-47.Bender Degree Markings. Figure 5-47. - Bender degree markings. To make accurate offsets of 2 inches or more in depth, you can mark a predetermined distance on the conduit. The distance between the bends depends on the depth of the offset and the amount of bend that you are going to use. Table 5-3 shows the formula to use to find the distance to be marked on the conduit. It also shows the constant multiplier that must be used in the formula for the angle of bends you intend to use and the shrinkage per inch. Let us use an example to see how the formula works. Suppose you need to avoid a part of a obstruction that requires an 8-inch offset, you are going to use 30-degree bends, and you are 40 inches from the obstruction. Table 5-3 shows that the constant multiplier for 30-degree bends is 2 and the shrinkage of one-fourth inch equals 2 inches for a total of 42 inches. Using the formula, multiply the depth of the offset (8 inches) times the constant multiplier (2), and the result is the distance needed between the bends (16 inches). 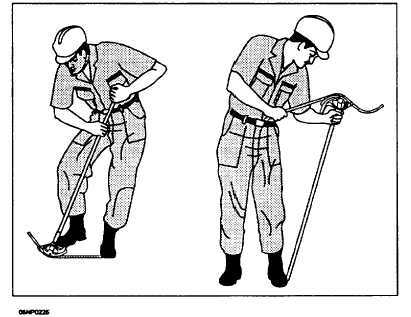 You place the first mark at 42 inches, the second 16 inches apart, and using the arrow of the bender, make a 30-degree bend on the same side of each mark, as shown in figure 5-46. In this example, a 30-degree bend gives us the offset we need. If you make both bends inside the marks, you will end up with much less than the desired offset. If you make both bends outside the marks, you will have too much offset. 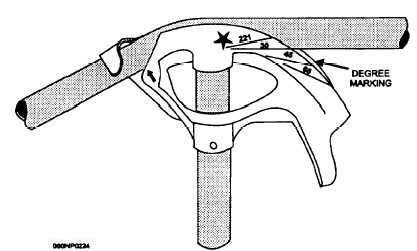 The amount of bend, in this case 30-degree at each mark, is obtained by using the degree markings on the bender, as shown in figure 5-47. Notice that the side of the conduit closest to the bender is in line with the 30-degree marking on the bender. If you have a bender without markings, a protractor (works especially well on larger conduit) can be used or you can lay a 30-degree angle out on a large piece of paper or on the floor with chalk. Then check the bend against the 30-degree angle you have laid out. Normally, offsets are made by making the first bend on the floor and the second bend in the air, as shown in figure 5-48. Figure 5-48. - Bending on the floor and in the air.